It’s not just an average Friday night lights game. It’s the Quarterfinals of the State Playoffs and yes that’s right it is held at Sand Devils Stadium on the campus of Page High School. On Friday night the #4 Sand Devils will host #5 Valley Christian (Chandler) Trojans for the second time in as many as two months. In Week 5 of Arizona High School football, Sand Devils hosted the 3A Metro West Trojans in Page. Sand Devils put up sixteen in the first quarter to cruise to a 22-15 Victory. 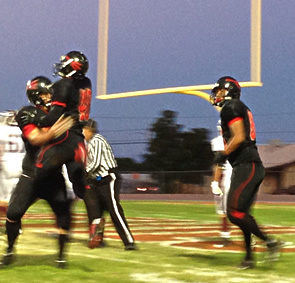 Sand Devils are off to their best start in school history dating back six decades. In the early part of the 70’s the Sand Devils made it to the State championship twice 1975 (10-2) and 1976 (11-1). The type of football has changed over six decades in Northern Arizona. Fast forward to 2018; this is just a season of many milestones and one for the record books for the small high school in the hub of the Grand Circle. A school that many teams hate to travel to but the Sand Devils have proven to own the 3A North conference in football. In just his second year as the head coach, Mitchell Stephens has not lost a home game (11-0) in his career at Page High School. Coach Stephens’s career at Page High School is (18-4). Stephens brings a coaching staff to the Sand Devils that has a winning mentality, discipline, and hard work. Stephens and the Players set a motto for every season at the begging of the season. Last Season was “H2L” Hate To Lose this season “FTF” Finish The Fight. Since the preseason our goal was to get a ring said, Coach Stephens. Sand Devils defense this season has only given up an average of twelve points per game. Leading the way for the Sand Devils this season on the ground is senior running back Kele Meredith with 1,976 rushing yards and 18 TD. Last time the Trojans and Sand Devils met Meredith had 15 carries 104 yards. Friday’s game should be another great game at Sand Devils Stadium.